* LAKE MEAD — Striper have been out at sunrise and sunset. Various swimbaits and threadfin shad are bringing in smallmouth and largemouth bass in the evening. Boulder Basin continues to be a hot spot, with anglers trolling through the Boulder Beach area. Smallmouth bass are still hitting, mostly near rocky shelves and points like the Boulder Islands. * LAKE MOHAVE — Anglers have had fair success working the coves. Largemouth bass are taking plastics in darker colorations in about 25 feet of water. Catfish have been hitting on anchovies at night from shore or boat by the dam. The striped bass, while rather elusive for some, have been found to take topwater baits as the sun hits the water. * LAUGHLIN — Action has improved slightly for the striped bass in the area. After the trout plants, anglers have found greater success using trout imitation lures to catch stripers, although anchovies still remain the top bait. Trout are dispersing from the stocking sites and in the area of Sunshine Peninsula. Anglers are catching near-limits using spinners and nightcrawlers. 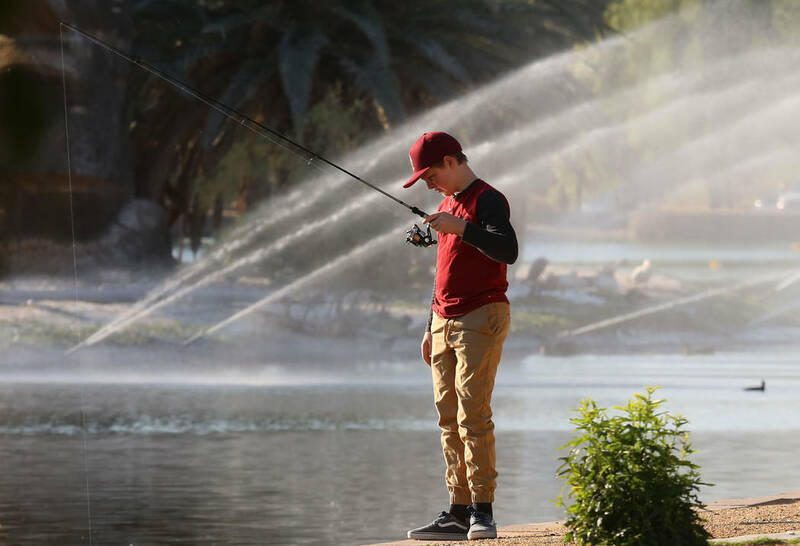 * LAS VEGAS URBAN PONDS — The final catfish stocking for 2018 is scheduled for next week, and depending on water temperatures, trout plants will begin in November. Bluegill and bass are starting to slow down with the cooling temperatures, but are most active between 9 a.m. and 4 p.m., taking mealworms and nightcrawlers. Catfish are taking nightcrawlers, shrimp and hot dogs. * KIRCH WILDLIFE MANAGEMENT AREA — Water levels remain low, with shoreline aquatic vegetation making fishing from shore difficult. Several anglers did very well over the weekend from the dam at Haymeadow, bringing in several trout measuring 13 to 15 inches using powerbait or spinning lures. Overnight temperatures have been dropping below freezing, which should help the vegetation problems over the next few weeks. * EAGLE VALLEY RESERVOIR — The nighttime temperatures have been dropping into the teens, which has stimulated trout action and has been very good around the lake, with the fish taking Powerbait in orange, green or rainbow colorations, along with small spinning lures, spoons and flies. Gold ribbed hares ear nymphs are working very well along the dam. With the chilling waters, the bass and crappie have really slowed down. * ECHO CANYON RESERVOIR — Chilly overnight temperatures have called a stop to bass and crappie action, but have improved the trout action. Fish are taking a variety of baits and lures, with Powerbait in orange, green or rainbow working best off the dam. * UPCOMING EVENT — The Nevada Department of Wildlife is offering a free family fishing clinic Nov. 17 at Floyd Lamb Park from 9 a.m. to noon, with basic instruction from 9 to 10 a.m. and fishing to follow. The class will cover the basics of fishing at the park, along with casting skills, fish identification, how to choose baits and lures, knots and rigging. Loaner rods, tackle and bait will be provided free of charge. For more information and to register, go to https://register-ed.com/programs/nevada/210-angler-education.